First of all: We may welcome a new face in the CONIFA-Cosmos: Welcome Aymara! The South American team of “Aymara”, a minority of Chile,Peru and Bolivia, signed a contract with CONIFA South America Director Jens Jockel to compete in the CONIFA World Cup 2016. In the following lines I (Jens) want to present you the travel report of my journey to Chile. The main aim of the travel was to enlist a team from South America for the CONIFA World Cup 2016.Further it was on the agenda to raise interest in CONIFA in South America, strengthen the links to CSANF and gain further information about possible CONIFA candidates, to cut it short: This aim was mainly reached due to my travel. On the 16th of April I started my adventurous journey in Düsseldorf,Germany, where I took the plane to Madrid, and from there to the capital of Chile: Santiago de Chile, where I arrived a day later. I stayed in Temuco for the time the Indigenous tournament took place. Temuco is the biggest city in the region of Araucania with approximately around 300.000 inhabitants. Araucania and especially Temuco is known for its cold climate (for South American standards), beautiful landscape and big percentage of people with German roots, as well as a big population of Mapuche (an indigenous tribe of Chile). 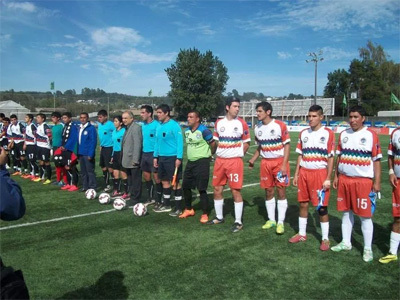 From Temuco, I travelled daily to the tournament venues of the Chilean Indigenous Cup 2015: Villarrica and Galvarino. These towns were chosen as the municipalities of the playing venues. The venues of the tournament were cleverly chosen: Villarrica is a small,interesting town 1.5 hours away from Temuco. Villarrica can be considered as touristic and authentic in equal amounts,while the small town of Galvarino (named after a Mapuche leader) has no touristic meaning and is a place that will not be stuck in your head for a long time most probably and is a more “quiet” place. Both venues (Villarrica and Galvarino) had pitches with artificial as well as natural grass, in Galvarino the games were even played simultaneously on both pitches. 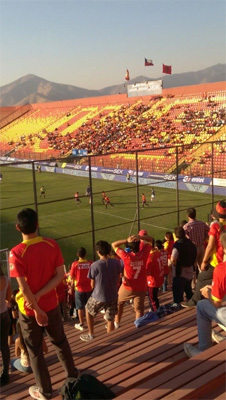 The final was held on artificial grass in the stadium of Villarrica. Despite the fact that only eight teams took part in the tournament, the quality of the football could be described as very diverse. While teams like Mapuche,Aymara or Rapa Nui could at least compete in semi-professional football, teams like the last-ranked Lickan-Antay, a team from the northern part of Chile or the Quechua are comparable to a “Sunday League”-team in Germany or England. The Sports Ministry provided water,equipment,referees etc. for the tournament, but did not care too much about what is actually happening down there, or showed interest in any other way in Villarrica and Galvarino. The final between Mapuche and Aymara was a really tense one. Final score: 1-0. It could have went either way. Remarkable was the high passion and aggression of both teams. There could have been easily 3-4 red cards, but the referee preferred not to let things escalate. More about the tournament: It was very disappointing to see, that the tournament had not got the attention of many spectators. With more professionality, certain PR-arrangements before the tournament and more attention by the city councils and Sports Ministry they could have made sure a bigger public interest. Only on the last two days, there were radio spots on a local radio station. Consequence: bigger interest of the population. With these arrangements before the tournament , I am pretty sure, the venues would have been at least half-filled. But at least the players themselves were really ambitious and showed passion meanwhile the tournament. After the tournament, I went back again to Santiago and from there to Valparaiso, a beautiful city on the pacific coast of Chile. It was a city of an amazing diversity and probably by far his favorite city in Chile. 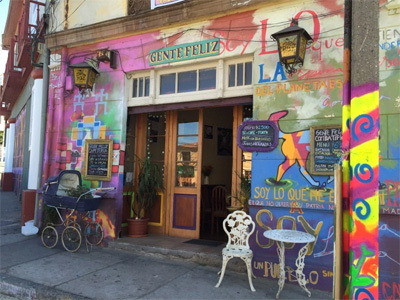 In Valparaiso you can smell and feel everywhere the intensity of life. Good laughter & smiling people, fresh air, good and bad areas, classical chilean food as well as restaurants with worldwide specialities for a small or middle budget , food and clothes markets, a high degree of passion for football (especially for their club Santiago Wanderers,which they really adore) and a very unique architecture. A big part of the city of Valparaiso is build on many hills, you can walk up there (if you have a certain level of fitness ;)) or you can use one of the 16 worldfamous ascensors for only 100-300 chilean pesos (roundabout 20-60 cents). Back in Santiago, it was time to sign the contract with the Aymara, who will compete in the WC2016 of CONIFA. This was very difficult,because they hardly spoke any English, so I needed help of a good friend of mine, who is actually an professional translator(thanks to Camila! 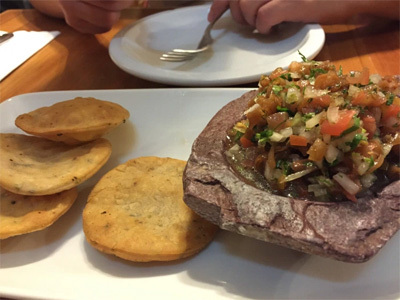 ), because the content of the contract had to be explained to Juan,the chef of the Aymara-squad in Spanish. On 5.5 I took my flight back to Madrid and from there to Duesseldorf,the final destination where I arrived at 6.5. There were a lot of good people I met and nice experiences I made, I really enjoyed the diversity of the country, the passion for life and football and the food. But I also was confronted with a lot of: lack of engagement, lack of professionality, people who don’t care, strange value of manners, egocentric mentality and a high degree of “we do care about nothing- approach” of the chilean Sports Ministry, who was seen as a keyfactor in reaching the aim to get Aymara (and maybe Rapa Nui) to the CONIFA-world cup. That was probably the most unprofessional and disrespectful way, somebody could imagine. They do not read e-mails, nor do answer, nor provide necessary things, arrangements or travel. Before the travel,they recieved a lot of e-mails in English, as well as Spanish , with necessary arrangements and details that they had to take care about. Neither the Sports Ministry nor their secretary cared about anything. So, because of their lack of engagement, not even a press conference was possible, which would have been really appreciable for spreading the idea of CONIFA and put a spotlight onto indigene football in Chile at least for a moment. They simply did not care about the impression they might make to : the teams themselves, CONIFA and their ExCo,nor the followers of CONIFA. So I speak quite frankly: The aim we reached, which is to sign Aymara and get them to the WC2016 of CONIFA, is more or less an achievement of a very small number of courageous people( Thanks to Camila and Gonzalo for their courage and passion !). Yes,unfortunately I can share that impression . Sad for the beautiful country and the majority of wonderful people there. I wish, that in the future the Sports Ministry of Chile cares more about such issues and improves the communication to CONIFA and Aymara. At least, our friends of Aymara, now got the possibility to show their colours at the WC-2016. …Maybe our friends of Rapa Nui(Easter Isles) change their mind and will also be interested in the WC-2016?